The Dentists Bondi Junction All-on-4 Dental Implants treatment concept provides a permanent, screw-retained, same-day replacement for the entire upper and / or lower set of teeth. The procedure is best for patients with significant tooth loss or decay and for people whose bone loss in the jaw area prevents them from getting dental implants. Often, tooth loss is accompanied by loss of the jaw bone which poses the problem of reconstruction of the jaw bone. For the implementation to be successful it is necessary to transplant bone from other parts of the body, for example, the iliac crest or the skull and apply it in the area where it is planned to deploy tooth or teeth. Transplantation of bone graft technique takes between three and six months so that the implants can be placed. After implant placement, it is necessary to wait two to three months, after which time it is possible the placement of the fixed prosthesis. The total rehabilitation time lasts about twelve months. Many patients cannot do the transplant of bone for general health reasons (diabetes and others). The rehabilitation of the teeth in this way (the transplantation of bone) due to health problems is impossible in 20% of patients. The Dentists Bondi Junction All-on-4 Dental Implants will address these drawbacks because it consists in establishing a fully customized denture (bridge) based only on four titanium implants. These implants act as “pillars” to the bridge that supports the prosthetic teeth. The invented process takes advantage of existing bone, even if scarce, avoiding having to use bone grafts. The All-on-4 treatment concept provides a permanent, screw-retained, same-day replacement for the entire upper and / or lower set of teeth. The procedure is best for patients with significant tooth loss or decay and for people whose bone loss in the jaw area prevents them from getting dental implants often, tooth loss is accompanied by loss of the jaw bone which poses the problem of reconstruction of the jaw bone. For the implementation to be successful it is necessary to transplant bone from other parts of the body, for example, the iliac crest or the skull and apply it in the area where it is planned to deploy tooth or teeth. Transplantation of bone graft technique takes between three and six months so that the implants can be placed. After implant placement, it is necessary to wait two to three months, after which time it is possible the placement of the fixed prosthesis. The total rehabilitation time lasts about twelve months. The All-on-4 treatment concept, will address these drawbacks because it consists in establishing a fully customized denture (bridge) based only on four titanium implants. 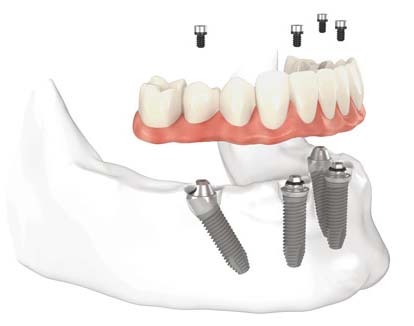 These implants act as "pillars" to the bridge that supports the prosthetic teeth. The invented process takes advantage of existing bone, even if scarce, avoiding having to use bone grafts. According to the first claim accepted under the European patenting process, the implant is characterized by having a form that allows an effective anchoring even in a jaw bone with a combination of soft and hard bone portions or inlays which fixture can be applied in holes with diameters which are substantially smaller than a main diameter of the fixture so as to produce a clamping effect on the fixture from the soft bone portion or portions, said fixture comprising an outer surface, the main diameter , an end surface and a front portion , which from the point of view of diameter grows very much narrower towards the end surface and which is arranged with both a cutting function and a threading function and is thus able, upon contact with a hard bone portion or portions, to penetrate through these hard bone portions without causing any substantial tendency for displacement of the respective hard bone portion , and a thread which has one, two or more thread turns and extends along the greater part of the outer surface and also down along the front portion while substantially maintaining its thread profile, wherein the main diameter is 4 mm, the diameter of the end surface is 2 mm, and the front portion has a Height which is substantially equal to the diameter of the end surface. The All-On-4™ prosthesis is the most economical option for stable dental implant treatment with exquisite esthetic results. This protocol uses a prosthesis strategically supported by four dental implants that are biomechanically positioned for maximum stability. Both the Teeth In a Day™ and Teeth In an Hour™ implant protocols can be performed using the All-On-4™ method of treatment. The All-On-4 dental implant procedure is not new. Using four implants to support permanent teeth happened for the first time at Pi in 1987, and has continued to be a reliable and effective resource for new smiles through a quarter of a century. The success rate for prostheses built upon four implants in each arch is the same as the success rate for cases requiring more anchorage. Using the 3-D scans from the i-CAT scanner perfects the planning process. The All-On-4 system allows a patient to choose from a wide variety of approaches to the fabrication of their new smile. The final prosthesis can be made in various grades of laboratory materials from acrylic to fine porcelain, always with the same attention to esthetic detail, but allowing for the financial investment to suit the patient’s comfort zone. The beauty of this system is that it is upgradeable. Additional implants can be added later and/or the prostheses itself can be fabricated with a higher grade of materials at the patient’s convenience. There is no question that permanent teeth add comfort, confidence, vigor and vitality to the quality of life. Dental implants using the All-On-4™ treatment protocol are unequivocally the best alternative to limping through life with dentures. Besides the priceless psychological benefits of natural looking teeth, a fixed smile eliminates lifelong visits for the relining of dentures as the gum tissue perpetually recedes. It also eliminates the need for an ongoing supply of adhesive products. Unmatched laboratory technology allows us to create each new smile with extraordinary sensitivity, customization and detail. Our doctors and laboratory technicians take pride in their ability to build smiles distinctively suited to each face and personality. This premium level of esthetic care is part of every All-On-4™ treatment package. The surgical procedure for the All-On-4™ protocol is minimally invasive and can almost always be accomplished simply using local anesthesia. Our very experienced team of professionals provides comprehensive pre-op and post-op information to ensure that each patient has the most comfortable experience possible in our center. Recovery time is brief and gratification is instant. The new smile is placed upon the implants immediately following the surgical procedure. For more anxious patients, the Dentists Bondi Junction provides general anesthesia through the services of an experienced, board certified anesthesia team. Dentists Bondi Junction What Are Dental Implants? Osseointegrated implants are effective in over ninety-six percent of all patients treated. Pi Dental Center is one of the leading centers for osseointegrated dental implants in the United States. A natural tooth consists of a crown (the part you see above the gum), and the root (the part hidden under the gum). It is the root in the jawbone that actually holds the natural tooth in place. A dental implant is a small man-made titanium fixture that serves as a replacement for the root portion of a missing natural tooth. Titanium is used because it is the most compatible with our human body. The dental implant is placed in the bone of the upper or lower jaw and functions as an anchor for the replacement tooth. After the bone has grown around the implant, implants can hold a crown, bridge or overdenture just like roots hold natural teeth in place. Dentists Bondi Junction What are the benefits of dental implants? Improved Appearance When teeth are lost, ongoing shrinkage of the jawbone occurs making the face look older. Dental implants can slow or stop this process. Dental implants look and feel like your own natural teeth. Improved Comfort Dentists Bondi Junction Dental implants eliminate the pain and discomfort of removable full or partial dentures. Since dentures sit on top of the jawbone and gums, continuous shrinkage of the jaw bone alters the fit of the denture resulting in slipping or rocking of the dentures. Exposed nerves and irritation of the gum tissue may add to the discomfort. Improved Speech With ill-fitting dentures, the teeth slip and slide around the mouth. The facial muscles become tense in an attempt to hold the teeth in place. This often results in mumbling, slurred speech or clicking noises. Improved Self Esteem considering all other benefits, Dentists Bondi Junction dental implants can improve your self-esteem. You may feel better about yourself. You can regain nearly all the capabilities that most people have with natural teeth, giving you renewed confidence, and allowing you to enjoy life, do what everyone else is doing and not think twice about it. Eat Better the average denture patient with an excellent fitting denture eats at 15-20% efficiency when compared to a person with natural teeth. As the jawbone shrinks, your chewing efficiency is reduced even more, making it difficult to eat certain foods. Dental implants can restore chewing efficiency comparable to that of natural teeth. This allows you to eat your favorite foods with confidence and without pain, enjoy what everyone is eating and not think twice about it. A full upper denture covers the palate of the mouth and reduces the ability to taste foods. With dental implants, you can have the palate removed from your upper denture so you can taste and enjoy your food. Convenience Dental implants can eliminate the numerous embarrassing inconveniences of removable partial and full dentures. You will eliminate the use of gooey denture adhesives that must be re-applied throughout the day. You will no longer need to cover your mouth when you laugh or smile, for fear that your teeth will pop out or fall down. Protect Your Remaining Natural Teeth Dental implants are often more appropriate than a bridge for the replacement of one or more adjacent teeth. With conventional bridgework, the teeth surrounding missing teeth must be ground down. Dental implants often eliminate the need to modify these teeth, resulting in a conservative, yet esthetic restoration.